Being able to generate and store electricity is of paramount importance. Without power, your radios become expensive paper weights.. Solar power is probably the best way to achieve independence from the grid. It involves no moving parts, thus less chance of failure. It certainly isn't the most efficient, but unless you live in alaska, you should get enough sun daily to charge a small battery. 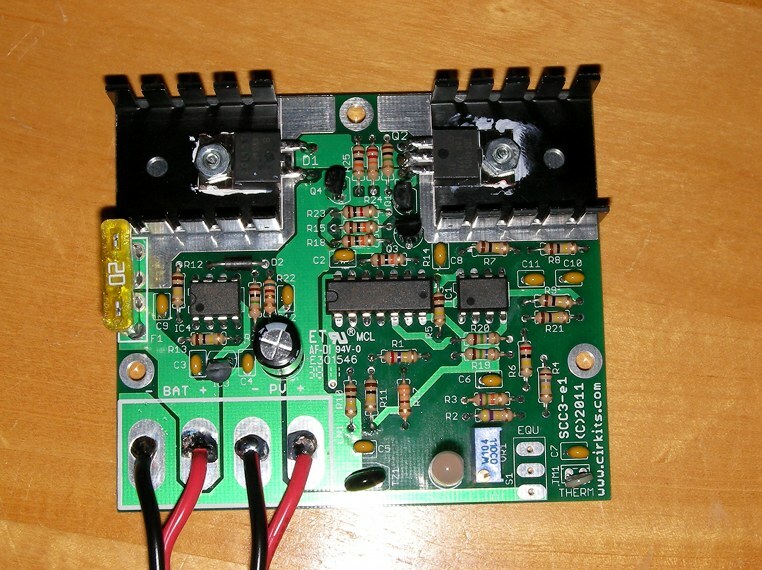 One more reason QRP (low power operation) is a good idea. http://www.cirkits.com/scc3/ Here is it after I finished building it. I need a box for it, probably a Hammond die-cast aluminum.. The kit was easy to build and seems to work. I can't really tell yet, because I don't have a solar panel to test it with. The only issue I have with it is that the soldering pads on the circuit board are too small and make soldering difficult. You will need a small soldering iron with a small tip for this job. The controller can handle 20Amps! Much more than I will ever need. However, since I plan on getting another sailboat in less than three years, it will come handy with larger solar panels aboard. For $50, you get something much better than the usual made-in-china controllers. Don't forget to store your controller in an EMP-proof box, or even better, have a backup! What's your solution to generate and store electricity? I had a large detailed post ready to go and the interwebs ate it! It's small enough to double sided sticky tape to my backpacking battery for a single compact unit. It is also fully potted to withstand the weather! I probably will never carry on my back more than 4.6A of solar panels so the capacity is plenty. This unit is also RF quiet unlike some MPPT controllers. Thanks Mitch, I think I'll get one of those too as backup!